Every year, we look back at our research to select the most memorable facts that illustrate important trends shaping our world. At Pew Research Center, the topics we analyze range from the specific subjects of video gaming and family caregivers to broader areas like political attitudes, global climate change and religious affiliation. 1Just 19% of Americans say they can trust the federal government always or most of the time. That’s among the lowest levels in over 50 years. 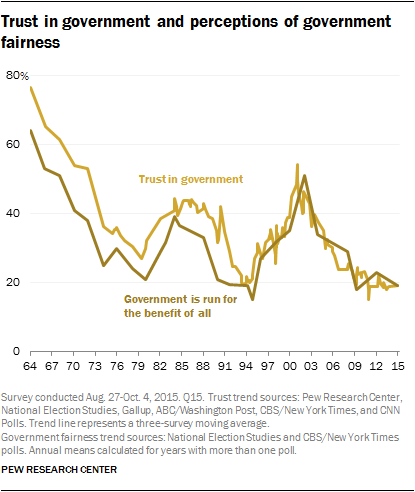 The long-term erosion of public trust is mirrored by a steep decline in the belief that the government is run for the benefit of all Americans. 3For the first time since the 1940s, more immigrants from Mexico are leaving the U.S. than coming into the country. The shift is due to several reasons, including slow economic recovery after the Great Recession that may have made the U.S. less attractive, as well as stricter enforcement of U.S. immigration laws, particularly at the border. 4There’s a substantial rise in the share of Americans who say the country needs to continue making changes to give blacks equal rights with whites. In July 2015, six-in-ten (59%) Americans said changes are needed, up from 46% in March 2014. These findings come in a year where racial tensions were high in much of the country, from protests over police shootings to student strikes at universities. Our poll also shows that a racial divide in public opinion persists: Blacks are much more likely than whites to say changes are needed. 5Millennials will surpass Baby Boomers in sheer numbers to become the largest U.S. adult generation. 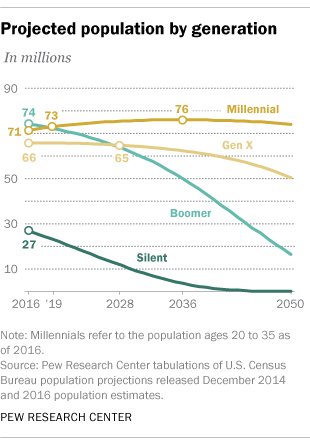 In 2019, there will be a projected 73 million Millennials (ages 19 to 34 in 2015), compared with 72 million Baby Boomers. This racially diverse, economically stressed and politically liberal group is also taking over American jobs: Millennial workers outnumber Gen X workers, making them the largest share of the U.S. labor force. Note: Item No. 5 in this post was updated on June 22, 2018, to reflect the Center’s revised definition of the Millennial generation and the updated year in which Millennials will be the largest generation. 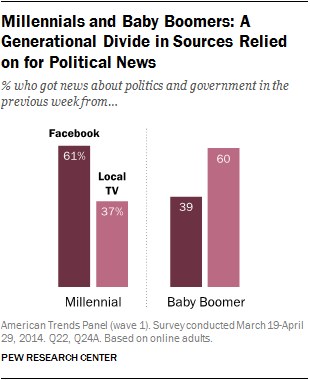 6For news about politics and government, social media may be for the Millennial generation what local TV is for the Baby Boomer generation. Six-in-ten (61%) online Millennials say they get political news on Facebook in a given week, a much larger percentage than any other source for news. That’s a stark contrast to internet-using Baby Boomers, for whom local TV tops the list. These trends also reflect a major shift taking place in the news world, as social networking sites increasingly become an integral part of Americans’ news experience. 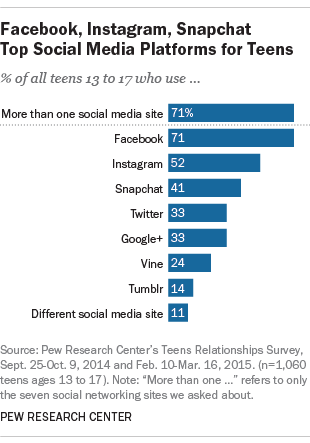 7For American teens, it’s not just a Facebook and Instagram world. While these two social media sites are the most popular, a majority (71%) of teens say they use more than one of the seven social networking sites we asked about. Much of this frenzy is facilitated by mobile devices: Nearly three-quarters of U.S. teens have access to a smartphone. 8People in countries with significant Muslim populations express overwhelmingly negative views of ISIS, according to our spring survey in 11 countries. Recent attacks in Paris, Beirut and Baghdad linked to the Islamic State in Iraq and Syria (ISIS) have once again brought terrorism and Islamic extremism to the forefront of international relations. Majorities in most of the 11 countries express unfavorable views of ISIS, but the exception is Pakistan, where a majority offer no opinion. 9Islam will grow faster than any other major religion in the world over the next four decades, according to our religious projections. 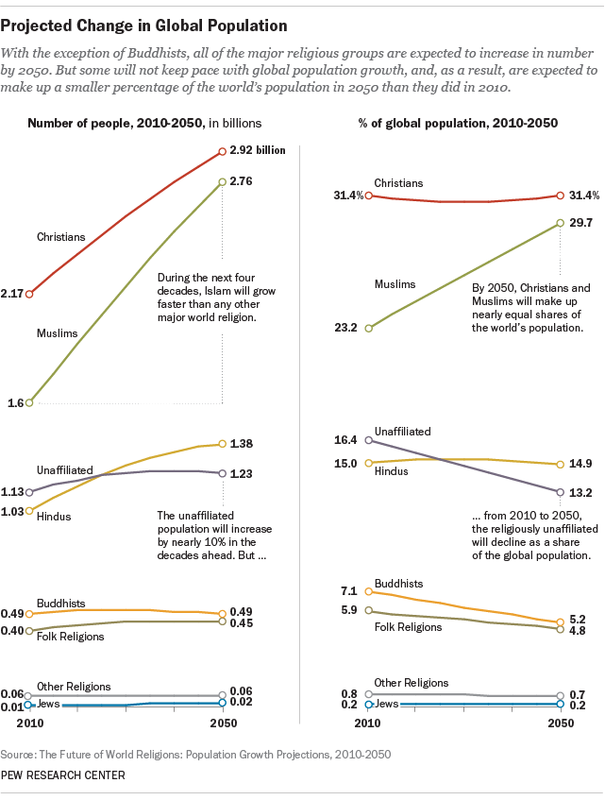 The number of Muslims will grow more than twice as fast as the overall world population between 2010 and 2050, and, in the second half of this century, will likely surpass Christians as the world’s largest religious group. Driving these changes are simple demographics: Muslims have more children than members of other religions, and they’re also relatively younger. 10Christians are declining as a share of the U.S. population, while the number of U.S. adults who do not identify with any organized religion is growing. While the U.S. remains home to more Christians than any other country, the percentage of Americans identifying as Christian dropped from 78% in 2007 to 71% in 2014. By contrast, religious “nones,” driven in large part by Millennials, have surged seven percentage points in that time span to make up 23% of U.S. adults last year. 11Nearly 59 million immigrants have arrived in the U.S. in the past fifty years, after the passage of a landmark 1965 bill that rewrote U.S. immigration policy. Today, a near-record 14% of the country’s population is foreign-born compared with just 5% in 1965, and that share is expected to rise to 18% by 2065. New settlers today also look very different from the predominately European immigrants of the 19th and 20th centuries: Among immigrants who have arrived since 1965, half (51%) are from Latin America and one-quarter are from Asia. 12Multiracial Americans account for 6.9% of adults, and they are growing at a rate three times as fast as the population as a whole. For much of the nation’s history, America has discussed race in the singular form. But with the rise of interracial couples, combined with a more accepting society, the language of race is changing. 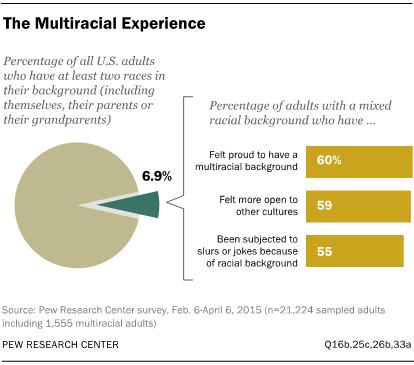 More than half of multiracial Americans are proud of their background and feel more open to other cultures. But a majority (55%) also say they have been subjected to slurs or jokes because of their racial background. 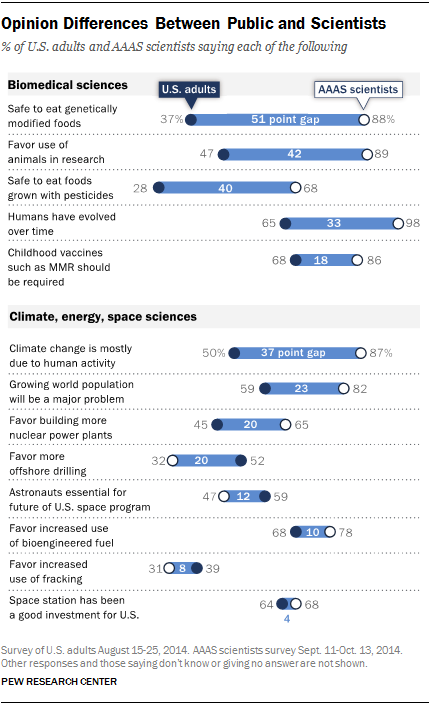 13Scientists and the American public are often far apart when it comes to views about science-related issues. Members of the science community, for example, are much more likely to say genetically modified foods and foods grown with pesticides are safe to eat, and that climate change is mostly due to human activity, according to our recent survey of U.S.-based members of the American Association for the Advancement of Science. 14A global median of 54% consider climate change a very serious problem, according to our survey of 40 nations. 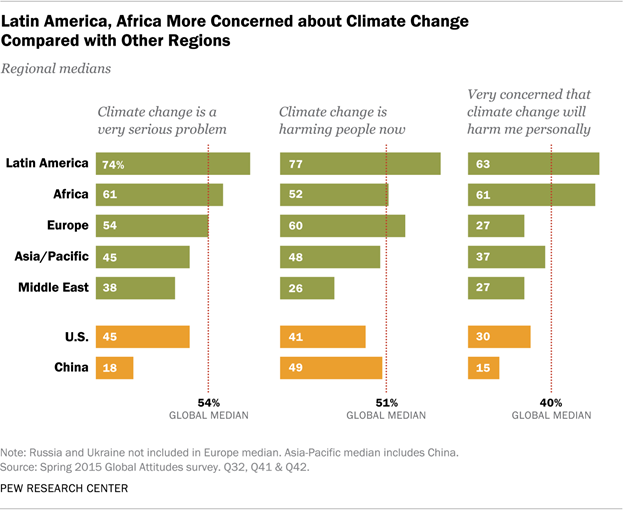 But there are regional differences on views of climate change, with people from Latin America and Africa expressing more concern than others. Before delegates from 195 nations approved a landmark climate accord in Paris this year to limit carbon emissions, our spring survey found a median of 78% supporting such a deal. 15Reporters for niche outlets now fill more seats in the Senate press gallery than do journalists who work for daily newspapers. 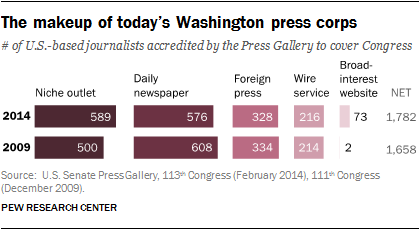 The face of the Washington press corps has changed markedly in recent years, transformed by this increase in the number of journalists working for “niche” publications and digital startups. Note: Item No. 5 in this post was updated on June 22, 2018.